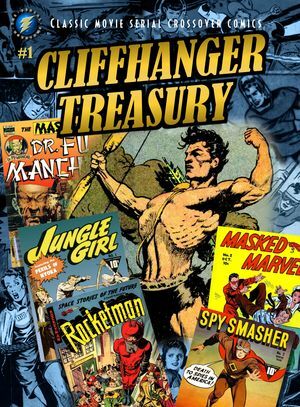 A king-size volume of comics from the 1930s and 40s inspired by classic cliffhanger movie serials or vice versa. We were going to try and do this in color but printing the interior in grey-tone allows twice the content for half the price. •	ROCKETMAN in "Wings of Evil"
•	THE MASKED MARVEL in "The Monster in the Mine"
•	SPY SMASHER vs. mystery villain "The Red Death"
•	THUNDA, KING OF THE CONGO by Frank Frazetta, in "King of the Lost Lands"
•	DON WINSLOW OF THE NAVY in "Maelstrom of the Deep"
•	CAPTAIN VIDEO in "Creatures of Doom"
•	THE DESERT HAWK in "The Wretched Ant-men"
This is the first of a four-issue series which when complete will reprint the complete multi-part serials THE MASK OF FU MANCHU by Wally Wood and the complete 6- chapter PERILS OF NYOKA, as adapted from the Republic serial. All stories are restored for clarity and include original covers. 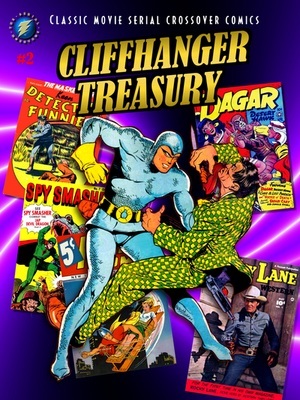 The second king-size issue of classic serial-character-related stories and art. BLUE BEETLE in "Origin of the Blue Beetle"
CAPTAIN VIDEO: "Makino, the Indestructible Antagonist"
DESERT HAWK: "Curse of the Lost Pharaoh"
THE MASKED MARVEL: "Public Enemy No. 1"
PERILS OF NYOKA: Chapter 2: "Valley of Sacrifice"
SPY SMASHER: "The Adventure of the Golden Wasp"
THUNDA: "The Monsters from the Mists"